Where in the US is a white Christmas most likely this year? 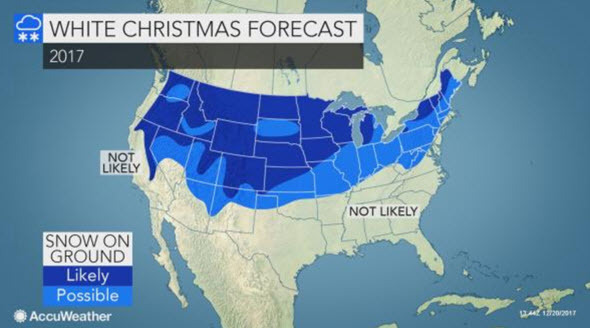 AccuWeather Global Headquarters – December 20, 2017 – AccuWeather reports several storm systems will impact the central and eastern United States during the days leading up to Christmas and will determine who will and will not experience a white Christmas. In addition to bringing the chance of a white Christmas to some areas, travel may be hindered by the storms. A white Christmas in the U.S. is defined as having an inch or more of snow on the ground on the morning of Dec. 25. A storm system will bring a swath of heavy snow from the northern and central Rockies and Plains to the Midwest and northern Great Lakes Wednesday night through Friday. Several inches of snow will fall in major cities such as Denver while a few places in the Rockies may get a foot of snow. Frigid air will plunge into the central U.S. behind this system at the end of the week and into the weekend, helping to keep most of the snowcover around for Christmas. While cold air pours across the central U.S., it will be a different story for the Southeast, mid-Atlantic and Northeast. 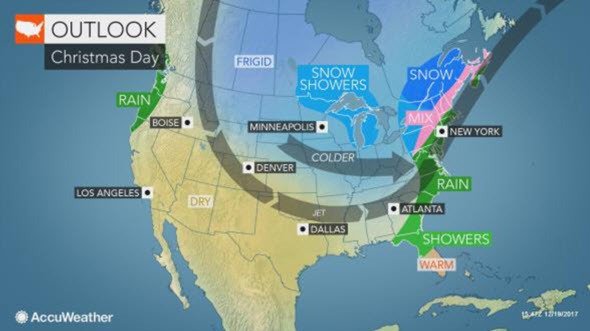 An area of high pressure across the Southeast will bring above-average warmth to most of the East during the days leading up to Christmas, according to Pastelok. The storm system across the Midwest will collide with this warmth, making for rain across a great deal of the Northeast. This will likely squash white Christmas chances for the major I-95 cities in the Northeast, including Washington D.C., Philadelphia, New York and Boston, and melt existing snow for many places of the interior Northeast. A few areas where the snow will likely last through Christmas will be western and upstate New York to northern New England where the snowcover is deep. While mild air will melt some of the snow, most of it will remain. The wild card leading up to Christmas will be a last-minute storm likely to develop in the southern part of the country on Christmas Eve. While multiple scenarios are still in play, this storm will ride along the jet stream and across the Northeast coast for Christmas morning. Should this be the case, there could be a fresh dose of snow from the Ohio Valley to interior parts of the Northeast on Christmas Eve night and Christmas Day, with enough cold to allow the snow to accumulate. Historically, there are several areas in the U.S. that often experience a white Christmas. 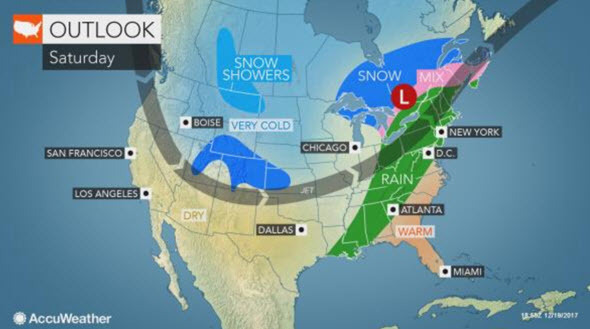 The northern tier of the country where it is often colder usually has an inch of snow on the ground on Dec. 25. Areas in and around the Rockies in the western U.S. often have plenty of snow built up by Christmas. Favorable lake-effect snow areas around the Great Lakes also have a moderate to high chance each year of waking up to snow on Christmas.